In 2003, the “White City of Tel Aviv, the Modern Movement,” was inscribed on UNESCO’s World Heritage List. Thus, the historic city of Tel Aviv received international recognition as a distinct representative of modern architecture and urban planning. The international recognition led to a conservation surge in the city and to large-scale entrepreneurship, which, alongside the rapid growth of the city, presented new challenges and dilemmas – a need to provide a broader cultural and social infrastructure for the “White City” area in particular and Tel Aviv in general. This article reviews the foundation of the “White City Center” at Liebling House, which constitutes a center for modern urban heritage, with its tangible and intangible layers. The center focuses on research, education, and community networking according to the HUL approach, understanding the city as a result of a historic layering of cultural and natural values and attributes, extending beyond the notion of “historic center” or “ensemble” to include the broader urban and cultural context. UNESCO. (2013). 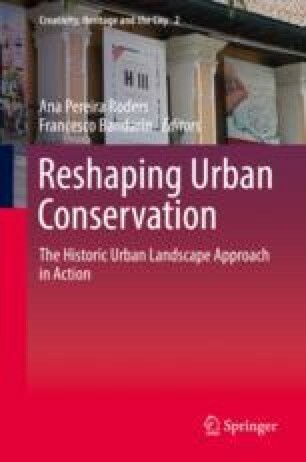 Historic urban landscape approach explained. http://whc.unesco.org/en/news/1026/. Accessed 25 Jan 2018.